This is not another metaphysically inspired adventure saga, based on The Lost Worlds of Ancient America. This book is meant to challenge your prior knowledge of the past; especially where academia based in faith is concerned. The author Frank Joseph urges readers to use their scientific mind to evaluate the information objectively, as this approach, as Joseph describes, is missing from Orthodox scholarship. When I read books I always look for an angle, and needless to say, one always exists. This book is different. There’s a lesson to be learned, not just from the ancient artifacts that have turned up in the most unforeseen places, but in the presentation. It was Joseph’s intention and his hope that The Lost Worlds of the Ancient America would be……. I’m not going to give you longwinded synopsis on the examinations of these ancient worlds, but I will wet your appetite a bit and tell you that you will be surprised. As many of you already know, I will be making my way to Tennessee this summer to teach. Imagine my surprise and delight to hear that the history we associate most with Tennessee, that being the Civil Rights movement is missing a few links. Imagine this movement being tied to a 1st century AD stone discovered in 1889. The Bat Creek Stone was discovered in an undisturbed grave mound and it was initially believed to contain Phoenician characters instead of Paleo-Indian. It gets even better. It is now believed that the characters carved in the stone were written in Hebrew. At this point I was scratching my head. How did a 1st century stone, written in Hebrew, makes its way into the Americas, and who did it really belong to? Who wrote it and why? Archaeologists Mainfort and Kwas, who initially contested the Hebrew inscription, later conceded that is was Hebrew but the Freemasons carved the characters. For those of you Freemason and Knight’s Templar enthusiasts like myself you’ll agree that both “secret orders”, if you want to call them that, had a connection financially to the Jews. Mainfort and Kwas' judgment is not without merit in my opinion. This is but one story from The Lost Worlds of the Ancient America and it certainly challenged everything I knew, and studied, about American Jews and when they arrived here. No matter if you’re reading about a Minoan Pendant discovered in Ohio to Anasazi Chocolate, this book will present some of the most surprising and compelling evidence of ancient cultures and advanced technologies that rival even days most complicated of machinery. When I mention evidence I do not mean that the author is trying to sway your opinion in an entirely new direction. Frank Joseph is attempting to give you the tools to have a new perspective, as opposed to basing everything you know, and seem to believe, about a particular subject on the censored history books you’ve previously read in school. 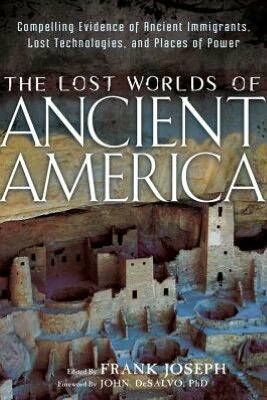 The Lost Worlds of the Ancient America is an easy read, it’s descriptive, simple in its scientific terminology, and there is just the right amount of visuals to spark your interest. It was a pleasure learning something entirely new, and trust me, with my head buried in archaeology and anthropology books for the past couple of years, it's a pleasant surprise to read about a subject, which has been presented in an entirely new light. This book was presented to me by New Page Books, a division of The Career Press. I did not receive monetary compensation for my review. All opinions are mine.